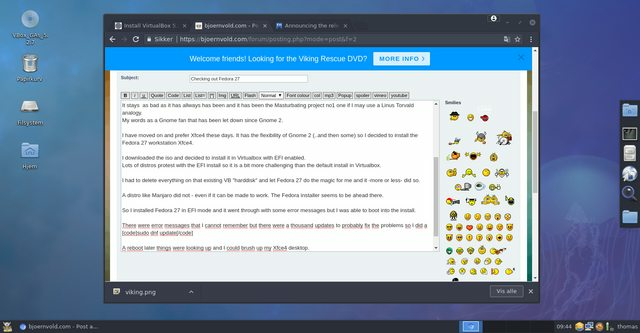 I have checked out Fedora a lot because it is one of the most important distros out there. Given the proud tradition of "breaking everything on purpose" makes it an obvious candidate too. I have found that Fedora has been letting that tradition down a bit since version 24 and even managed an upgrade without breaking anything. But fear not - Fedora did leave some moody behaviour to honor its bleeding edge tradition. 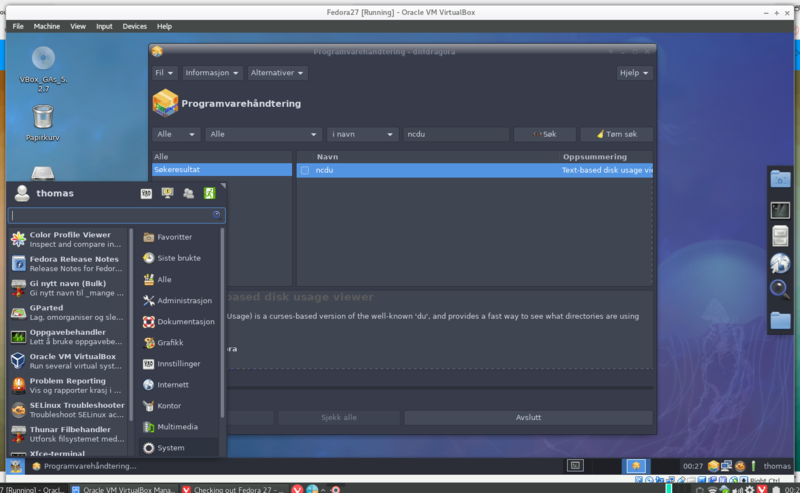 I simply could not run Chromium on it and getting it to behave well in Virtualbox was quite impossible. Fedora has been a Gnome 3 distro for some time and I am very underwhelmed by it. Years and years of assurances that "Gnome 3 has really become good now" have simply not been true. It stays as bad as it has allways has been and it has been the Masturbating project no1 one if I may use a Linus Torvald analogy. My words as a Gnome fan that has been let down since Gnome 2. I have moved on and prefer Xfce4 these days. It has the flexibility of Gnome 2 (..and then some) so I decided to install the Fedora 27 workstation Xfce4. I downloaded the iso and decided to install it in Virtualbox with EFI enabled. Lots of distros protest with the EFI install so it is a bit more challenging than the default install in Virtualbox. I had to delete everything on that existing VB "harddisk" and let Fedora 27 do the magic for me and it -more or less- did so. A distro like Manjaro did not - even if it can be made to work. The Fedora installer seems to be ahead there. So I installed Fedora 27 in EFI mode and it went through with some error messages but I was able to boot into the install. A reboot later things were looking up and I could brush up my Xfce4 desktop. Fedora has hat this issue on several of my tests and it still does not work. I am sure that it can be fixed with a double sommersault and lots of but that should really work out of the box..don't you think? and then I ran Alsamixer and hit F6 and unmuted and activated everything. Anyway - I do have a fully functional desktop now and it might well be one of the safest too in these times of CPU flaws. SE-Linux is activated and hardening the distro out of the box and patches may well be present in Fedora before any other distro. While I like distros like Solus it is always a valid question what will happen if the main developer looses interest or becomes incapable of maintaining the distro for some reason. Fedora is not going away with its solid foundation and neither is OpenSUSE nor is Debian or Ubuntu. The main new thing is that the GUI interface for package installation has changed. Yumex-DNF is out and replaced by dnfdragora. Here you can search for and install packages or update your system. I do miss a function to add and manage repos though. Dnfdragora is based on RPMdragora which again is based on the good old RPMdrake from Mageia . Fedora 27 is still is a very capable desktop and would still be the one to prefer over a SUSE desktop IMO. Debian holds the same important status as Fedora does and is a great server due to a very conservative policy which makes it always impossible to compare to Fedora with its bleeding edge policy. Debian does compare well with Centos and it is a matter of taste which one you should choose in the server department. Fedora27 is a nice Desktop distro well worth exploring but not for beginners. It takes some experience to even make the sound work and to get under the "skin" of SElinux. and turn it back on again with 1.
and different developer want remove the urpmi ..
but more functional it's need only a Samba-manager like in Drakconf/mmc. the name could be dnfsamba ..
me too.. but i should works.. i have see it anywhere on an manpage in the net..
i must reinvestigate it soo.. So far Dnfdragora looks like a simple GUI front end for dnf. You can search for software and install it - and that is pretty much it. in a gui the whole software, also if you search anything. not an Webinterface, no, a real Gui..